Living the life like dive down below! Home/News/Living the life like dive down below! It’s got a good ‘ring’ to it: ‘Live Like Dive Downbelow’! But don’t just say it, everyone needs to really live it! 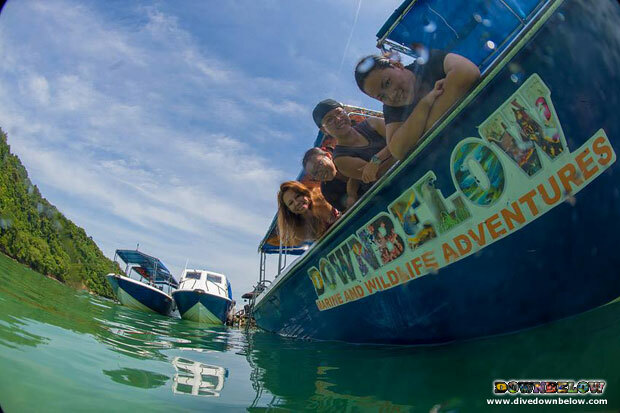 To ‘Live Like Dive Downbelow’ means experiencing together all the incredible adventures that can be found in Sabah. Scuba diving, mountain climbing, white water rafting, wildlife spotting, jungle trekking, snorkeling, kayaking, laughing, eating, and more – is just so much better when doing it together! The staff team at our Head Office who organize entire holidays for our clients are passionate about exhibiting the best Sabah has to offer, and the best way to do that is to experience the activities in and around Sabah for ourselves so that we may have a first-hand account. Recently, a few of our lucky ladies of the Head Office went to our premier PADI 5 Star IDC Dive Centre facilities on Gaya Island for a day of snorkeling, kayaking, scuba diving and jungle trekking! We wonder what our next adventure will be! For more information on the various attractions we offer, get in touch with our Head office, where one of our friendly and helpful members of staff will arrange an itinerary to suit your needs to experience an amazing Borneo adventure! By Joanne Swann|2014-08-06T14:00:35+08:00August 6th, 2014|News|Comments Off on Living the life like dive down below!